“Children of a common mother.” “Brethren dwelling together in unity.” These words mark the Peach Arch, a 70-foot-tall monument that stands on the coastal border of British Columbia and Washington State, and a symbol of the friendship between Canada and the United States. But more than that, it represents a shared history between the two regions, bound geographically to Cascadia, the stunning Pacific Northwest of North America. Washington and British Columbia also share a common pioneering culture. Innovation and ingenuity are in the lifeblood of Cascadia, a region that enjoys lush forests, bountiful fish runs and hunting grounds, rich coal reserves, and proximity to the Alaska Gold Rush, creating an economic powerhouse that would fuel the Industrial Revolution and be the birthplace of groundbreaking workplace rights. The Cascadia Innovation Corridor, an initiative to foster collaboration between companies, universities, and governments on both sides of the border, enhances the longstanding tradition of cooperation and innovation by bringing the region into a future that relies on technology to solve the world’s most important problems. This October, in a move that went beyond ideation into actualization, the third Cascadia Innovation Corridor Conference was held in Vancouver to bring together organizations from the public and private sectors. “Today, Vancouver and Seattle are both international cities, their GDPs are among the best in the US and Canada,” said former Washington Governor Christine Gregoire, current CEO of Challenge Seattle and co-chair of the Corridor’s steering committee. Former Washington Governor ​Christine Gregoire, current CEO of Challenge Seattle and co-chair of the Corridor’s steering committee. Photo by Cascadia Innovation Corridor Conference. In 2017, B.C.’s merchandise exports to Washington totaled nearly $6.5 billion, which amounts to fully 30% of all U.S. bound exports. Similarly, Washington exports more to B.C. than other Canadian provinces combined. And that relationship is only getting stronger with the Cascadia Innovation Corridor. Greg D’Avignon, President and CEO of the Business Council of British Columbia (BCBC) and co-chair of the Corridor’s steering committee, spoke to the fast growth of both Washington and B.C. over the past five years. “We are both very diverse, and not just in one segment of the economy,” he said. Greg D’Avignon, President and CEO, BCBC. Corridor’s steering committee co-chair. Photo by Cascadia Innovation Corridor Conference. “There’s gold lying around everywhere and no one else is picking it up,” said Heather Redman, co-founder and managing partner of Flying Fish Partners, a Seattle-based venture capital firm. The Cascadia region has potential for serious growth, especially in the fields of artificial intelligence (AI), augmented reality (AR) and virtual reality (VR), precision and digital health, and education. But Redman said that what’s still missing is the venture capital needed to put Cascadia on the same financial playing field as Silicon Valley. In 2017, for example, a total of $1.3 billion in venture capital was invested in Seattle, versus $19.7 billion in San Francisco. According to Pitchbook, in British Columbia in 2017, that number was only $310 million. Huge names have been coming out of the Cascadia region for decades, from Lululemon and Hootsuite to Amazon and Microsoft. Seattle is the cloud computing capital of the world, and where the second wave of AI and machine learning-based economy has developed and thrived. This, Redman says, will only attract more talent and industry. British Columbia, home to big names like Electronic Arts (EA) and Relic Entertainment, has thrived as a video games hub for decades. It makes sense then that the virtual reality industry has developed quickly in the region as well. “Everything from gaming to the application of VR in various fields is growing exponentially in this marketplace, and it’s tied to the strengths of Seattle and their cloud computing base,” said D’Avignon. Innovative applications of AR and VR. Photo by Shutterstock. 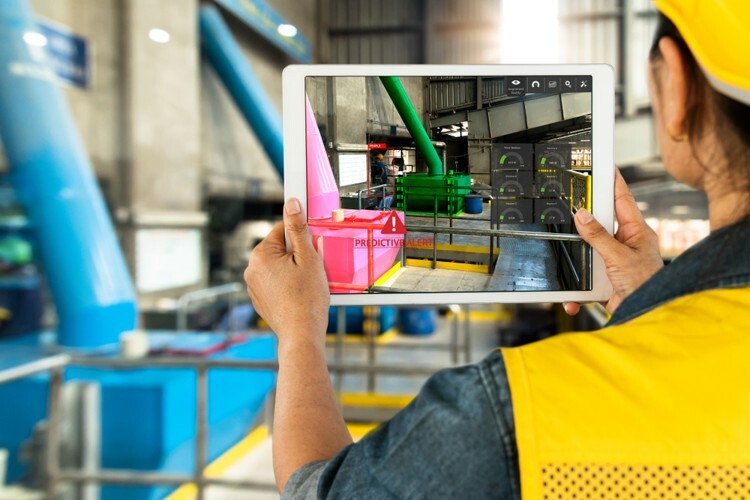 One interesting way that companies are leveraging the economic history of the region with mixed reality is by applying VR and AR to pipelines and mining. D’Avignon said the TransCanada Pipeline and Goldcorp Mining are using mixed reality and data analysis from the past 70 years to inform understanding of how the movement of the earth will affect pipelines, or to reduce fiscal and environmental costs of mining by determining how to most productively extract iron ore.
Finger Food Studios is a B.C.-based company that develops custom solutions to address their clients’ business challenges, using mixed reality and artificial intelligence. They’re currently working with mining and pipeline companies to create data-driven visualization platforms that provide important context to end users before ground is broken. In addition, they were the first company in the world to develop an industrial holographic experience on Microsoft’s HoloLens platform for PACCAR, allowing the company to make more effective decisions faster. “We’re very excited about the work we’re doing in retail,” said Graham Cunliffe, senior vice president of business affairs and operations for Finger Food. “We’re thinking about how a brick and mortar store can compete with a large online retailer, and how we can create compelling in-store experiences as opposed to ordinary transactions or clicking ‘buy now’ on a website. Think about having Augmented Reality in a store, where you can have a very small area dedicated to showing all the products you sell rather than having it all out on the floor. “Being located in the Corridor is a huge advantage to any company working in the AR and VR space as there is excellent access to technology partners and clients,” said Cunliffe. “Health knows no borders, and so it makes sense for our major health organizations to be working together,” said Sue Paish, CEO of Canada’s Digital Supercluster, a collaboration among Canadian businesses, schools, and government partners that’s supported by the Canadian government’s innovation strategy fund that matches approved private sector investments. Sue Paish, CEO of Canada’s Digital Supercluster. Photo by Cascadia Innovation Corridor Conference. This spirit of collaboration is catching across the border. Organizations like the B.C. Cancer Agency, the Fred Hutchinson Cancer Research Center in Seattle, and the Seattle Cancer Care Alliance in Seattle have joined together to share research, information, and to collaborate on developing better predictive indicators, treatments, and sustainable health outcomes. D’Avignon says that the region, specifically B.C., is world-leading in oncology, genomic data, and immunotherapy. “There’s a huge heterogeneous data set that goes back 40 years, and all of this data with the new technology is creating a market advantage for health outcomes,” he said. Leveraging these strengths is materializing in really interesting ways, like the Vancouver interns at Microsoft who are working with B.C. cancer researchers to create holographic visualizations of tumors, powered by “single cell genomics” cloud-based analysis. “We’re risk takers, entrepreneurs, innovators, but we have a social impact conscience on how we can make a difference here and globally,” said D’Avignon. Automation and digitization will have a far-reaching impact on the workforce. Currently six out of ten jobs have more than 30 percent of activities that are automatable. McKinsey predicts that the rise in need for advanced IT and programming skills could grow as much as 90 percent between now and 2030. The current workforce needs to be reskilled and the future workforce needs to be adept in technology. And the Cascadia Innovation Corridor is helping usher in the labor pool of the future. WA Governor Jay Inslee and BC Premier John Horgan sign an MOU at the conference. Photo by Cascadia Innovation Corridor Conference. For its part, Finger Food is getting involved in bringing STEM subjects into schools in B.C. “We want to break down the barriers of entry to STEM,” said Cunliffe. The company is purchasing and donating Sphero R2D2 droids to schools in Metro Vancouver to give kids access to technology, allowing them to develop their curiosity and get excited about pursuing tech later in life. Using Apple’s Swift Playgrounds platform, Finger Food was able to design and develop educational content with a Star Wars theme to engage students. Cunliffe said Sphero has also been a great way to encourage girls to get into engineering and technology. In Seattle, Challenge Seattle is partnering with the University of Washington and Tsinghua University of China, with founding support from Microsoft, to create the Global Innovation Exchange (GIX), which will pull some of the best and brightest around the world together around a cross discipline learning style that’s based on how the private sector actually works today. “We’re also going to announce a start-up partnership that will be an offshoot of GIX where graduates can take what they’ve learned and work directly with University of B.C. and UW to create a start-up,” said Gregoire. The Cascadia Urban Analytics Cooperative is another partnership between UBC and UW that involves mentoring the top data scientists from both universities, under the guidance of academic researchers and public stakeholder groups, to address social and urbanization issues affecting citizens in the Cascadia region. And in partnership with Microsoft, the B.C. Institute of Technology (BCIT) has developed a re-skilling program that’s based in a mixed reality curriculum, with the aim of helping students easily transfer into tech-focused roles so that they can succeed in the new economy. One such exciting program allows UBC students to interact with the HoloLens headset in order to better visualize neuroanatomy. As technology and digitization continue to transform the modern world, new start-up regions will continue to pop up. The Cascadia Innovation Corridor, by virtue of crossing the border, has many advantages over other hubs. “I think we move as fast and break as many things as Silicon Valley, but I think we do it more quietly,” said Redman. “I almost think the entire region operates in stealth all the time, and that’s been good and bad.” Redman said that being a lesser known hub for innovation, at least when compared to the Valley, has made it harder to attract capital in the past. But at the same time, it’s allowed the region to keep competition in the dark, which may have allowed cloud technology to flourish there. The capital needed to fuel all of the innovation that should be occurring in the region is on its way, ushered in by the strategic intentions of the Cascadia Innovation Corridor and the incredible potential of the region itself. The Peace Arch’s 100 year anniversary is just around the corner in 2021, which will incidentally mark the fifth year of the Corridor. In only two years, support on both sides of the border for enhancing existing partnerships and building new ones has flourished. Here’s to many more years of cooperation and innovation.